My sixth post with Criminal Element has gone live. It expresses some of my opinions about World War II. Culturally, we’re obsessed with that time in history. I’m no exception. The image here is an example (me portraying a Royal Air Force air commodore). The post linked above shares some reasons why. Having been a member of the Boy Scouts, the presumption that all badges and patches were meant in celebration of both enjoyable experiences and the accumulation of experience could be a forgivable error. It wasn’t until high school, however, that I learned of one more such mark. By the end of the 1970s, gay rights advocates adopted the pink triangle – as reclamation, as an emblem. At that time, I suspect I should have suspected there were more triangular signs. That prompt – to know the full list – came when I joined the Freemasons. In that case, as with all non-Jewish political nonconformists, the Masons detected and captured by the Nazis were forced to wear a red triangle. In the United States these days, we hear all parts of the political spectrum engaging in hyperbolic assertions that one party or another is bordering near fascism. While we must always be vigilant to oppose the rise of another Nazi party, the ubiquity of accusation makes it difficult to see the lines that must not be crossed. During the time of the original Nazi Party, a declaration of loyalty was required. Not making such a pledge “earned” a triangle at least. If the same system were used today, the image at the left might be on my sleeve and pant leg. It would indicate a Mason who continued to meet after a presumed warning, internment, and intent to escape. 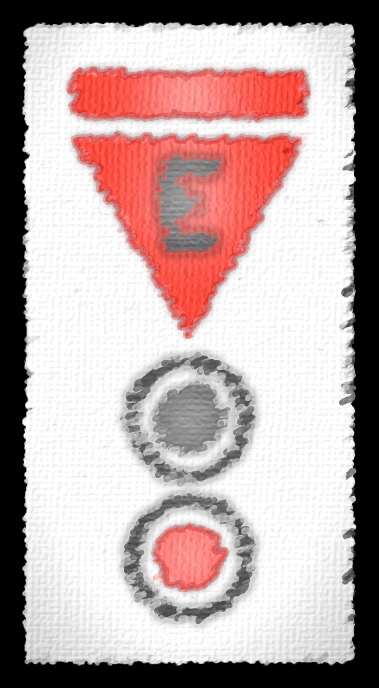 The E stands for Erziehungshäftlinge, which designated intellectuals and suspected organizers of resistance. In addition, everything seems to be dubbed “the civil rights issue of our time”, including – most recently – the impact of climate change. More hyperbole. More blur. Meanwhile, there is a group quietly making use of this information. I am not affiliated and only discovered the white triangle while trying to find an image of liberty that was not a photograph of the statue stood on Ft. Wood, Bedloe‘s Island (i.e., The Statue of Liberty). Liberty Symbol describes itself as an association with the goal of support, development, and promotion of individual and collective liberties. 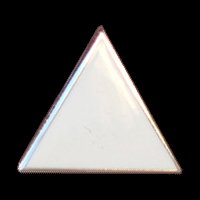 This effort has adopted a white triangle as a symbol for those who see themselves as promoters of said liberties. The symbol serves a dual purpose – also being an emblem for those who have had their liberty curtailed unnecessarily. Too quietly, Liberty Symbol offers the symbol as a public domain icon and encourages its use. The white triangle was chosen in another reclamation of a sort. I’ve purchased a fair few and given two as gifts and tokens of kinship. Note: Acheter is the French word for to buy.